CosmeCore: An automix composite material that cuts like dentin. Cosmedent's CosmeCore is a dual-cure, automix resin core material that cuts like dentin and is designed to supply high strength in core build-ups at the same appointment it is placed. 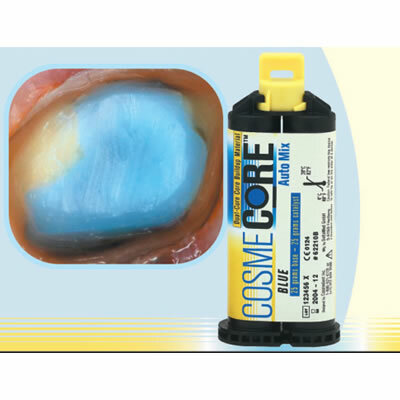 Sold in 3 types of cartridges, including blue, white, and A2, CosmeCore is radiopaque, which helps distinguish the product from tooth structure in radiographs to a depth of more than 7 mm. According to the manufacturer, the product is available in economical 50-gm cartridges and 1 core build-up pays for the entire tube. The 12 dentists who participated in the Dental Product Shopper evaluation of CosmeCore commented on a range of features, including ease of use, handling, immediate hardness and cuttability. All 12 evaluators ranked ease of use as either 'very important' or 'important' when purchasing an injection comfort system. All of the evaluators agreed that handling was either 'very important' or 'important' when buying an injection comfort system. Four evaluators described CosmeCore's handling as excellent, and 8 evaluators described the product's handling as very good or good. According to the manufacturer, following polymerization, the cured material hardens with 'strength characteristics similar to dentin.' Five evaluators rated CosmeCore's immediate hardness as excellent, 5 rated the product's immediate hardness as very good, and 2 evaluators rated the product's immediate hardness as good. Ten evaluators said they would defi nitely or probably recommend CosmeCore to colleagues and 9 evaluators said they would defi nitely or probably purchase CosmeCore.